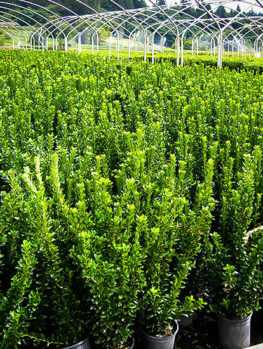 The various Euonymus Bushes are wonderful and hardy garden shrubs, ranging from 12 inches tall to 20 feet, depending on the variety. They are all hardy to zones 4 or 5 and will grow in sun, partial-shade and full-shade, depending again on the exact variety you choose. They are drought-resistant and terrific ‘backbone’ plants for every garden, filling difficult spots and providing essential structure, as well as being some of the best ground-cover shrubs available. Most are known for their spectacular scarlet fall coloring, but others are beautiful evergreens with gold and silver foliage colors. These are trouble-free plants that have few pests or diseases and will grow in any kind of soil, from sand to clay. Once established they are highly resistant to drought and make ideal plants for low-maintenance gardens and gardeners. If you want easy plants that will fill your garden and cause you no work, then the Euonymus bushes are your friends. There are two broad groups of Euonymus, with very different uses. 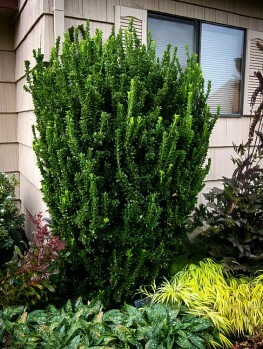 First there are the shrubby kinds, which grow into rounded shrubs between 5 and 20 feet in height. These will grow in any kind of soil in full sun or light shade and they are valuable for their brilliant fall color. Green all summer, these plants will turn scarlet-red each fall, bringing a blaze of color to that beautiful season. No wonder they are called Burning Bushes. These are excellent plants for foundation planting around your home, filling corners and framing windows. They can be used as background plants behind flowering shrubs and flowers to give depth and texture to your garden layout. They also make terrific hedges, either left to grow informally, or clipped a couple of times a year to make a neat boundary or enclose part of your garden. This is one of the easiest ways to turn a sprawling, unstructured garden into an interesting space, with your vegetables screened from your flowers, or your children’s play-area separated from the rest of the garden. 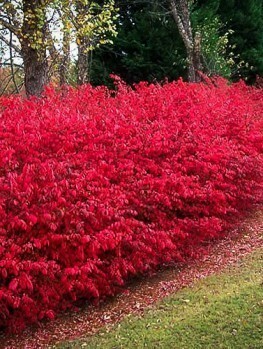 If you have ugly chain-link fences, perhaps those required around a pool area for example, a hedge of the Fireball Burning Bush makes a great dense screen to hide the fence and also bring color into your garden every fall. Even in winter when the leaves drop the twigs are dense enough to give good screening all year round. The second group of Euonymus plants are low-growing shrubs that are either evergreen or semi-evergreen, keeping most or all of their leaves through winter and providing great winter color, especially if you use the beautiful variegated forms like the Emerald ‘N Gold Euonymus. These plants will grow equally well in full sun or full shade and spread across the ground to keep weeds away. Their gold or silver leaves are a colorful lift for shady spots and because they are low-growing they will never block windows and light from your home. There are around 130 different species of Euonymus, mostly found in China and Japan, but also in Europe as well as in North America and Canada. They are also called Spindle Trees because the hard wood and straight, thin twigs were once used to make spindles for the hand-spinning of wool. Most Euonymus are deciduous shrubs or trees but some are evergreen. Several, including one of the American species, are creeping plants that grow on the forest floor. They all have the leaves arranged in pairs opposite each other on the stem and the leaves are usually small, oval in shape, smooth and sometimes glossy. 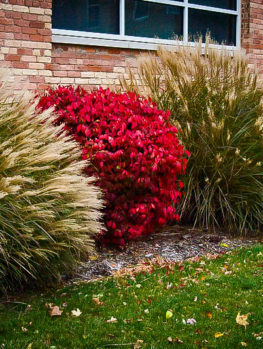 They often show strong fall colors in pink, red and orange and are the most decorative feature of many of these shrubs. 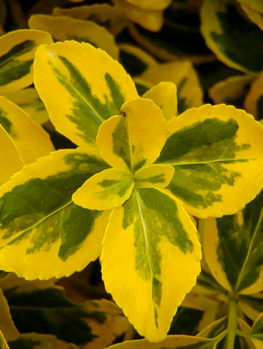 Others have gold or silver variegated leaves which bring a splash of color to shady areas. The flowers are not showy and usually very small, greenish or whitish, and arranged in bunches. These turn into clusters of hanging fruits that have 3 to 5 compartments and split open in fall to show brightly-colored seeds with scarlet-red or bright-orange coats. These make an attractive fall display on some species. The seeds are popular with birds and can be an important winter food. From a gardening viewpoint there are two groups of Euonymus. First there are the deciduous shrubby kinds, which are often very hardy and reliable plants for any garden, especially in cooler areas. These grow into shrubs between 5 and 15 feet tall, often wide-spreading and bushy. They are very drought-tolerant and grow in sun or partial shade. They can be clipped into attractive hedges. 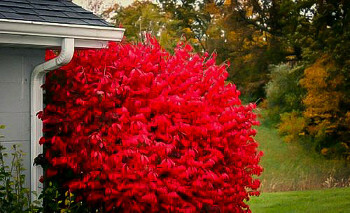 One of the very best and most widely grown Euonymus is the Burning Bush, Euonymus alatus. This plant comes from China and has been grown in America for over 100 years. It is known for its spectacular fall colors of scarlet-red which give this plant its common name. The wild plant grows into a large shrub or small tree 15 to 20 feet tall, which makes it very suitable for large properties, but too big for most gardens. However, there is a smaller form of this plant, called ‘Compactus’, which only grows to around 10 feet in height. It has the same spectacular fall color, but a compact, dense and rounded form. Sadly, in colder areas this form is prone to some winter damage, with younger branches being killed. 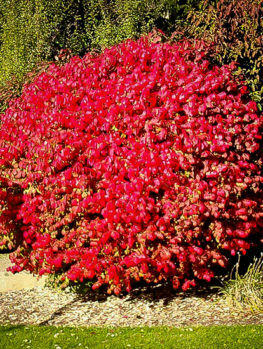 To overcome this limitation a form called the Fireball Burning Bush has been developed which is even smaller, growing to just seven feet tall and this great plant is totally free of winter-kill even in the coldest parts of the country. It is the Burning Bush of choice for those who want the best. The other type of Euonymus is an evergreen plant coming from Japan, called Euonymus fortunei. This is a very different plant from the upright, shrubby Euonymus, because it grows as a creeping plant across the forest floor and also climbs up trees. It is commonly called Wintercreeper because it keeps most of its leaves all winter. This plant is often grown in the special form ‘Coloratus’ as a ground cover for shady beds where it will spread over a large area, making an attractive mat of foliage. It will also grow up walls on the shady side of buildings and houses as attractive ‘Ivy’. It is hardy to zone 4 when growing on the ground and to zone 5 when on walls. Wintercreeper is a strange plant, because it changes its appearance as it grows. When it is in shade it will keep its spreading form, but when it naturally grows up a tree into the sunshine it changes and becomes bushier, with shorter stems. It also may then begin to flower and produce attractive orange seed clusters. Once it turns into this ‘adult’ form it does not return to the spreading form even when returned to to the ground and planted in shady spots. 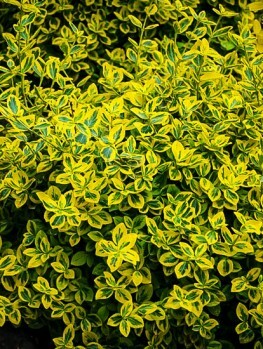 There are several forms of this bushy form grown as dwarf shrubs and a number of them have variegated leaves, with cream or yellow borders. The best of these is the Emerald ‘N Gold Euonymus, which has beautiful tiny leaves of a rich gold color with a green centre in every leaf. It is compact and low-growing to about 12 inches tall, but will still spread 3 to 4 feet wide and even climb a few feet up a wall. It can be clipped to keep it neat and tidy and the Emerald ‘N Gold Euonymus makes a wonderful ground-cover plant for sunny and shady locations. Euonymus bushes are hardy from zone 4 to zone 8. They need some winter cold, so they will not grow in warmer zones. The spreading kinds may lose some of their leaves in zone 4, but they will come back strongly in spring when the snow clears. These plants will grow in any kind of soil, from sandy soils to clay, and in acid or alkaline conditions. Once established they are very drought-resistant and never need additional water unless there is an extended severe drought. Indeed, the fall color is better on plants that are dry in summer. The lower-growing spreading kinds are just as tough but they do not like to be grown in wet soils. As for the sun, every variety of Euonymus will do well in full sun. 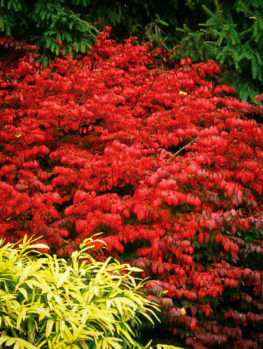 The Burning Bush types will grow in shade, but their fall color will be reduced. The spreading Euonymus will grow well even in full shade. Although some soil preparation can be helpful, Euonymus are one of the few plants that can just be planted, even in difficult conditions, and still thrive. Ideally you should dig a hole about twice the size of the pot and mix a little organic material, like compost or peat-moss, into the soil you remove. Take your new plant out of the pot, place it in the hole at the same depth and put back most of the soil. Fill the hole with water and let it drain away. Now you can put back the rest of the soil and your new plants are off to a great start. During the first season it is a good idea to water once a week with a large bucket of water, but after that you will normally never need to water again. An Easy and Attractive Plant For Your Garden! If you are looking for tough, easy and attractive plants for your garden, then the different kinds of Euonymus are great choices. Whether you are looking for dense rounded shrubs like the Fireball Burning Bush, or beautiful ground-cover plants like the Emerald ‘N Gold Euonymus, these reliable garden favorites will thrive with very little attention, making them an ideal choice for gardens right across the country.